President Donald Trump said Friday that much of the press represents the "opposition party," echoing a top adviser's description of the news media earlier this week. "I think the media is the opposition party in many ways," Trump said in an interview with Christian Broadcasting Network's David Brody. "I'm not talking about everybody but a big portion of the media," he added. "The dishonesty, the total deceit and deception makes them certainly partially the opposition party, absolutely." Trump said the media is "much more capable than the opposition party," referring to the Democrats. "The opposition party is losing badly," he said. "Now the media is on the opposition party's side." Trump's comments came in response to a question about Steve Bannon, the White House chief strategist, who said in an interview with The New York Times this week that the news media "should be embarrassed and humiliated and keep its mouth shut and just listen for awhile." "I want you to quote this," Bannon said. "The media here is the opposition party. They don't understand this country. They still do not understand why Donald Trump is the president of the United States." In what has been a whirlwind first week in office, Trump has demonstrated that he and his administration intend to continue the anti-media rhetoric that propelled his presidential campaign. 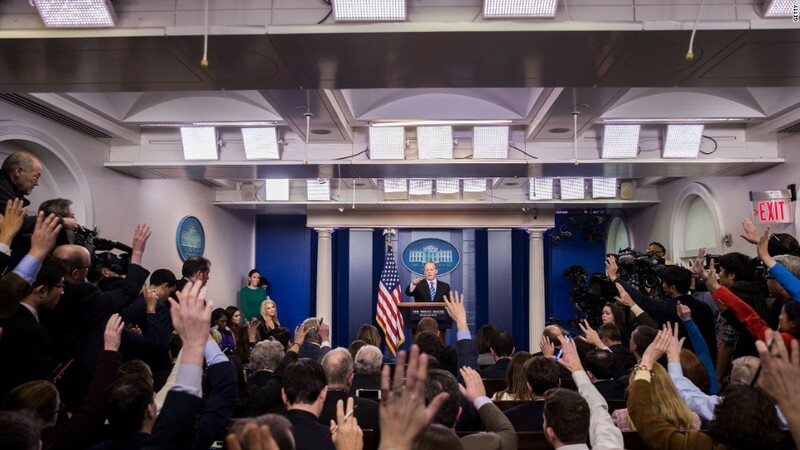 On Saturday, White House press secretary Sean Spicer delivered an angry statement in which he wrongly accused journalists of misreporting on the crowd size at the inauguration ceremonies the day before. Bannon, the former chairman of the right-wing news site Breitbart, was reportedly among the Trump advisers who pushed Spicer to deliver the statement. Trump hasn't just relied on his staff to ridicule and attack journalists. Speaking at CIA headquarters last Saturday, Trump said he has a "running war" with the media. On Friday, at his first press conference as president, Trump reacted with annoyance to a question by a reporter from the BBC who had been called on by British prime minister Theresa May. "This was your choice of a question," Trump said to May, drawing laughter from some inside the White House's East Room. "There goes that relationship."